In the spring we often see the plants commonly called Bleeding Hearts in our Kentucky landscape. The common ones we see at a lot plant nurseries are a type from China called, Lamprocapnos spectabilis, so they aren’t even in the genus Dicentra. However, there are a few types of Dicentra Bleeding Hearts native to Kentucky! The native Bleeding Hearts fall into the genus ‘Dicentra’. Often native plant nurseries will call them by their genus name or their other common name to distinguish they are a native. 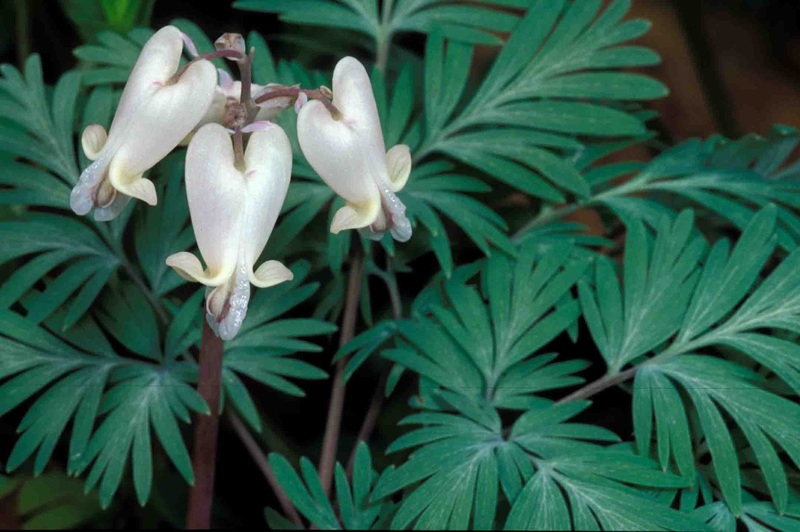 There are three varieties we can typically find, Dicentra canadensis (Squirrel Corn), Dicentra cucullaria (Dutchman’s Breeches), Dicentra eximia (Wild Bleeding Heart). We love how many native plants are named after what they may look like! 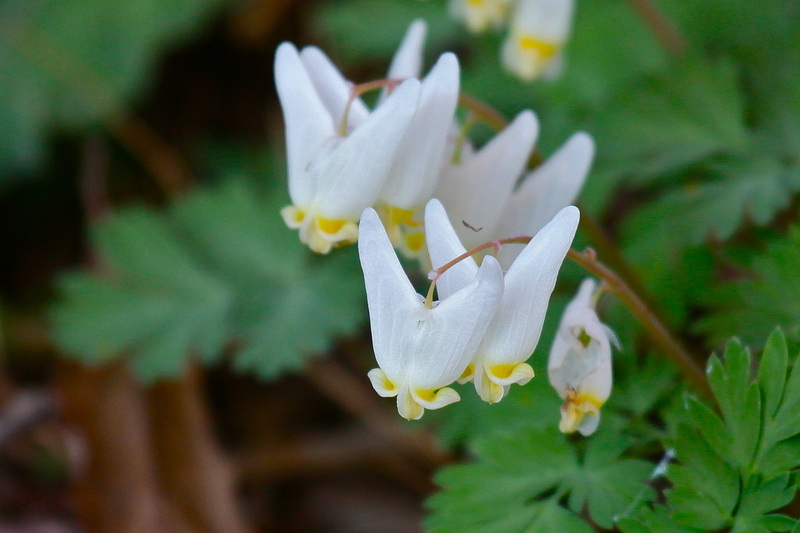 Dicentra is a woodland plant blooming in the spring, liking moist soils. They like shade to part shade. They may keep blooming in cooler weather, but will stop flowering or the plant will die back once heat of the summer settles in. It is an early nectar source for native bees and also migrating hummingbirds. The honey bee isn’t able to use it as a nectar source because its tongue isn’t long enough to reach the nectar in its flower. Of course there are many other things honey bees enjoy and the more we can provide our native bees the better our landscape is. Dicentra’s seeds are dispersed by ants! The seeds are coated in a sticky substance that ants love. They take the seed back to their nest to eat that sticky substance. The seed is then left in their nest to germinate! Consider Dicentra for an early spring flowering plant. They look beautiful next to Hostas, Bluebells, Plox, and the Pasque flower during the spring. For a constant blooming flower bed, you can plant them in areas with other shady plants that will leaf out later in the season such as Indian Pinks, Soloman’s Seal, Ferns, and some Asters. 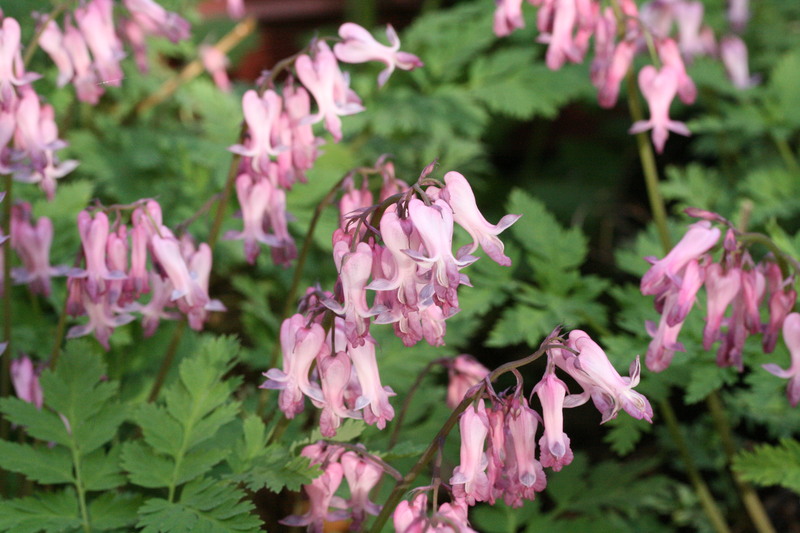 Bleeding hearts spread is 1′-2′ tall and wide and they are low maintenance.